RAWALPINDI: Japanese Foreign Minister Taro Kono said on Thursday his country looks forward to enhancing its cooperation with Pakistan, especially in the field of counterterrorism. 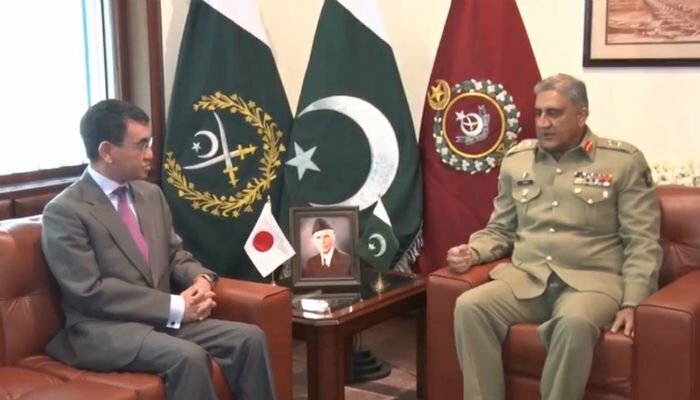 The remarks were made when FM Kono, who arrived in Pakistan on Wednesday night, called on Chief of Army Staff (COAS) Gen Qamar Javed Bajwa at the General Headquarters here. The Japanese foreign minister was presented a guard of honour. He also visited the martyrs monument where he laid a floral wreath. During his meeting with Gen Bajwa, the foreign minister was given a briefing on Pakistan’s efforts against terrorism and the country’s contribution towards regional peace. Kano appreciated and acknowledged Pakistan’s efforts towards regional stability and said that Japan looks forward to enhancing its military cooperation with Pakistan. The visiting foreign minister also talked about Japanese assistance in rehabilitation of the temporarily displaced persons and the provision of scanning equipment for border crossing points. This is the first visit to Pakistan by any Japanese foreign minister since 2009 when Katsuya Okada, the then FM visited the country.